There is a reason Billy Beck has won the World’s Greatest Trainer Contest — He is truly extraordinary. The demands of my life require as much as 16 hours on stage, and I’ve always just dealt with the chronic pain. Today I can tell you that with his help, I’m in the best shape of my life and I do more with less pain than I ever could in my twenties. Billy Beck III not only owns his craft but puts his entire heart and soul into what he practices and preaches! His upfront, no BS approach to getting results (period!) was monumental in helping me conquer the mental and physical challenges that come with elite level athletics. No fluff… just the real deal. Billy is a master of the art and science of transforming physiques and lives! If you are ready to really dig in, sweat and earn the change you desire, you’ve come to the right place! Billy Beck III exemplifies what a MASTER Trainer should be. Throughout all of my many years playing in the NFL and working with many coaches and trainers, I can tell you that Billy’s training and nutrition strategies far surpass anything that I’ve ever learned. Getting Started On The Weight Loss Journey – Mission Makeover Episode 2. In this episode I teach the Mission Makeover ladies the importance of breaking through mental barriers as well as the importance of mastering your emotions. I also push the ladies to take the one step most people never ever take! BB3 TV: The Training, Nutrition & Mindset to Live Like A Lion! Highlights from this week’s episode: 1 minute 13 seconds: Stairway To Heaven Workout. 3 minutes 22 seconds: BB3 Uncut. 3 minutes 46 seconds: BB3 “Living It” Jenna Neaves. Highlights from this week’s episode: 46 seconds: One Armed Push-Up Progression. 1 minute: Limiting Factor In Push-Ups. 2 minutes 01 second: The Key. 3 minutes 04 seconds: Where To Place Goals. 3 minutes 39 seconds: “Living It” Omar Singh. 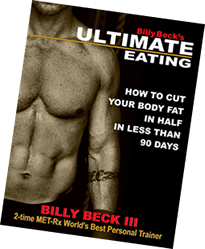 Billy Beck III, voted the MET-Rx World’s Best Personal Trainer 2-times for delivering results, brings to you some of his proven strategies to shedding fat fast, creating relentless energy and mastering your mind. This is not some made up program this has been battle-tested with real people in the real world. The key to physical transformation can be found in the 3 Pillars of Power. Once you know these you can put them into immediate action by taking Billy’s 7 Day Challenge. A complete program that creates unstoppable momentum. Don’t wait any longer get started now! Highly recommend for anyone looking for a great battle plan without all the gimmicky BS. I really enjoyed the book and look forward to seeing my personal results. Take charge of your life and start today. It tells you exactly what you need to know and how can be implemented in a very simple way, so everyone can understand the concepts behind the physical well being without need to be a professional in the material. As a personal trainer myself this was a nice read with many reminders into the most crucial aspects of getting the body to peak performance. Good recipes also. Read this book, went on vacation, and read it again. It’s amazing how much information is in this book. Billy is one of a kind, I’d debate there is nobody out there like him. He is so dedicated to his craft it’s almost scary. Everything from the nutritional plan to demonstrations on different lifts is included. Billy defies myths and states facts about everything needed to get in shape. If you can’t take his advice from this book and apply it for 60 days, fitness isn’t for you. I’m embarking on the mission now!